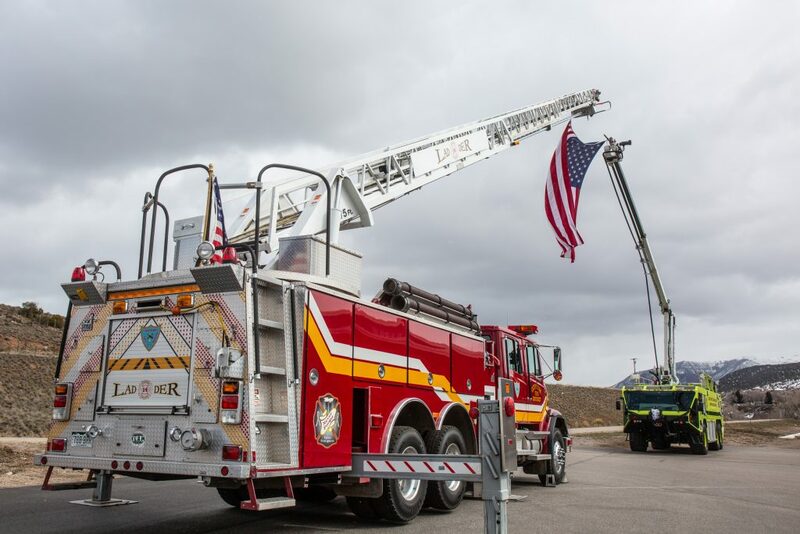 Firetrucks are placed to create an archway outside of the Eagle River Center at the Eagle County Faigrounds to honor Eric Hill. At approximately 11:55 a.m. Saturday, the Vail Public Safety Communications Center aired calls for ARFF 10-15; Eagle Fire 907; Gypsum Fire 1448; and CDOT 2-Mary-18-1. The crowd numbering more than 500 assembled at the Eagle River Center knew Eric Dean Hill couldn’t answer any of those pages from any of the agencies where he had proudly served. “This is last call for Lt. Eric Hill. His tour has ended. 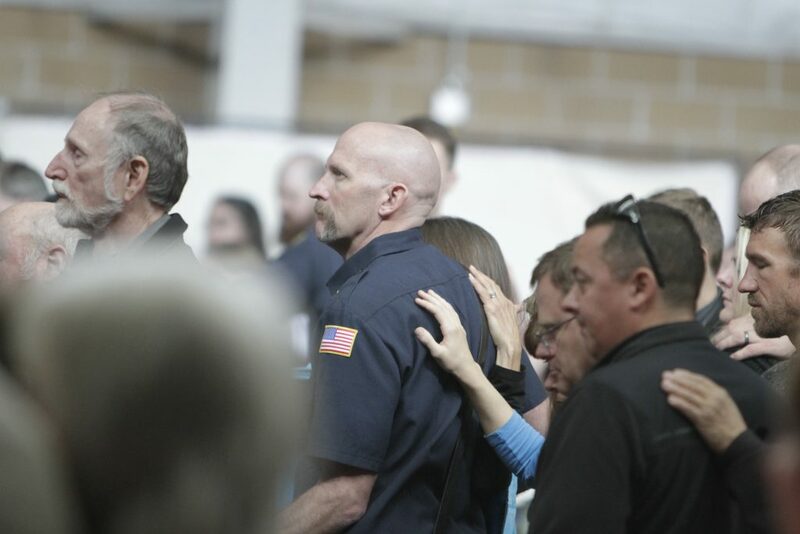 Thank you for being a warrior, a firefighter, a father, a grandfather, a husband, a son, a co-worker and an un-wavering friend,” came the announcement from the Vail dispatch center. 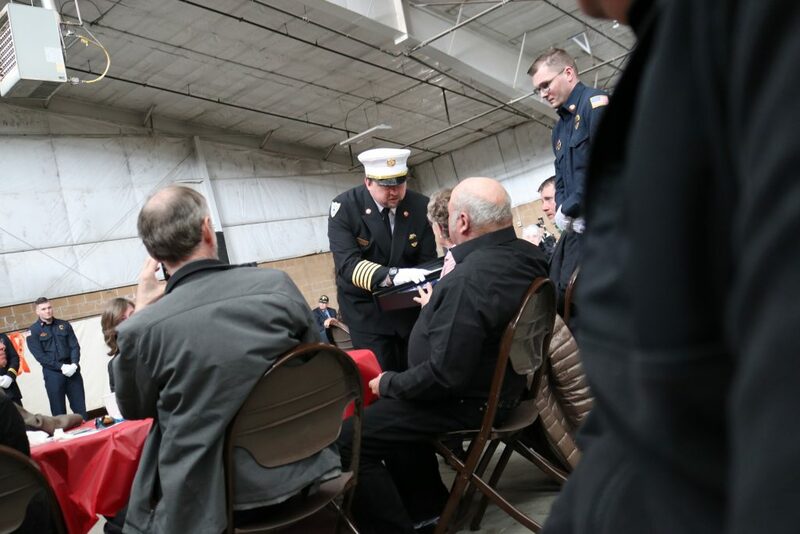 A lone trumpet had already played taps and representatives from the Gypsum Fire Department and the Colorado Department of Transportation had presented flags to Hill’s wife Cissy and his parents Rick and Cathy Hill. Mourners — many attired in military and emergency service uniforms — were still brushing away tears and sharing smiles, reflecting on a ceremony that honored Hill’s service to his community and his country. At times the gathering was painfully poignant. At others, it was delightfully irreverent. Throughout, it was heartfelt. Gypsum Fire Chief Justin Kirkland presents an American flag to Cathy and Rick Hill, parents of Eric Hill. Rev. Sid Spain, of Eagle, called Hill “a child of the valley.” Hill spent the majority of his 51 years in the Eagle Valley — attending local schools, graduating as an Eagle Valley Devil and returning to make it his home after six years in the U.S. Air Force. He served the community as a firefighter, EMT and mentor. He served his family as a loving husband, father, grandfather, son and brother. He left his many friends with wonderful memories of his fun-loving, mischievious persona. Mike Clarke, a friend and fellow CDOT worker, said he had tried several times to write down what he wanted to say about his friend and co-worker. He shredded each of those attempts. “We will just try to fly by the seat of our pants, like Eric would,” Clarke said. Clarke talked about the many conversations he shared with Hill, dealing with everything from politics to parenting challenges. “We talked about raising daughter, which is why you see Eric with no hair,” Clarke said. Colorado State Patrol Trooper Jake Best talked about how he and Hill grew up together and how the Spring Creek Valley was their playground as youngsters. Best noted that he and Hill began as volunteers at the Gypsum Fire Department at the same time. Eventually, Hill became a senior member of the Gypsum firefighting crew and he became renown for his training expertise. “Eric had a wealth of knowledge. He was always willing to help you learn, even if it was learning the hard way,” Best said. Best recalled how Hill always seemed to have a special tool or a unique insight when it came to dealing with a problem in the field or an equipment issue at the fire station. “I have always been told heaven is perfect, so I don’t know what Eric will be working on, but he will find something,” Best said. Childhood friend Randy Ward shared colorful story about Hill. Ward related how when the two of them were 11 years old, he and Hill toted their BB guns to the Trail Gulch area when an irresistible opportunity presented itself. Hill filed a shot at the backside of a woman who was crouching in the brush, experiencing a restroom emergency. As the room erupted in laughter, Ward told how the lady jumped up, figuring that something had bit her. He recalled how his friend’s face turned bright red with the effort it took not to laugh and get caught. “If this story sounds familiar to you, we apologize now,” Ward said. Brad Jones was a friend and collegue to Hill for nearly 20 years. 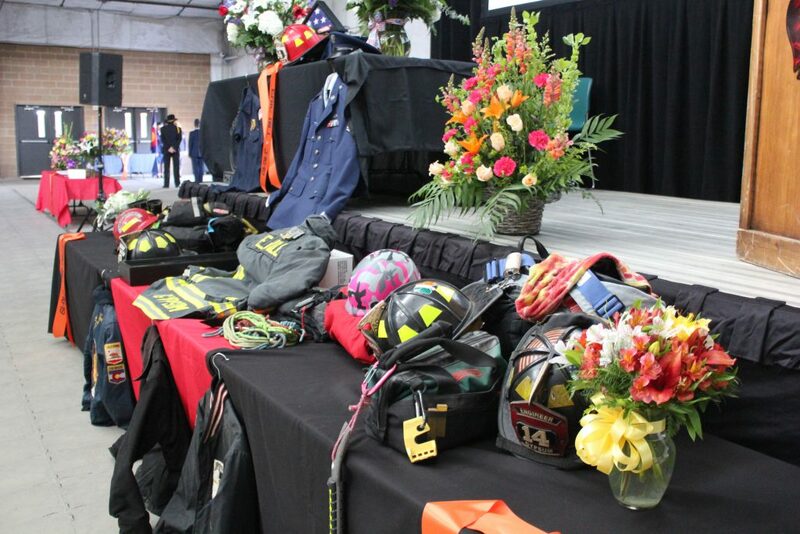 A display of uniforms and memorabilia at his memorial service demonstrated the impact of Eric Hill’s life in the Eagle Valley. Dohman talked about how Hill shared his love of the outdoors, hard work and even ACDC music with his kids — himself, his sister Kasie and his brother Brodie. He noted that his father taught them the importance of self-reliance and making sure that things were done correctly. “Dad was one of the most optimistic people I have ever known,” Dohman told a crowd of people who were weighted down by the day’s sadness. Dohman noted he wasn’t much of a poetry fan, and neither was his dad, but he then shared a piece called “The Dash”saying Hill lived a life full of love in the dash between 1968 and 2019. At the conclusion for the service, Hill’s brother-in-law Perry Weston instructed the assembled crowd to stand, place a hand on a neighbor’s shoulder, and think of a happy memory of Hill. Weston asked the mourners let that spirit of happiness take over the room to sustain his loved ones in a celebration of the life Hill lived. Mourners share a moment of remembrance for Eric Hill. Photo courtesy Tracy Trulove, Colorado Department of Transportation. Then the trumpet played and the tour of duty ended for ARFF 10-15; Eagle Fire 907; Gypsum Fire 1448; and CDOT 2-Mary-18-1. “May he rest in peace. Godspeed, sir. We have the watch from here,” were the final words from dispatch.